A white filling gives you the option to receive essential treatment without it being noticeable or visible to others. Most adults will need at least one if not more fillings at some stage or another and with white fillings you can feel confident that your treatment is subtle yet effective. Decay eats away at healthy enamel and causes cavities or holes. If the cavity is left untreated it can grow in size and leave the inside of a tooth vulnerable to infection. A tooth that has been affected by decay may also feel more sensitive than usual. 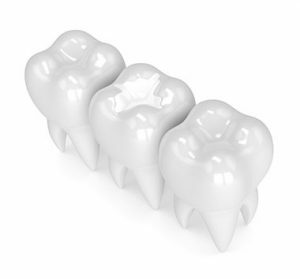 At Broseley Dental Practice we offer patients white fillings made from composite resin or porcelain. White fillings are barely visible once applied to the tooth, so many of our patients prefer this option to traditional metal fillings. If you require a filling, we will discuss the best option for you and at the next appointment we will start the treatment. The affected tooth will be cleaned and the damaged enamel removed. The white filling will then be used to fill the cavity and prevent further damage to the natural tooth. Our dental team will be happy to advise you about cleaning techniques and how to avoid the need for further fillings.